Your tour company, Peruvian Odyssey, took care of us from the moment we arrived to the moment we left. We were pampered, expertly guided, watched over and treated like VIPs the entire time. It will be hard to take another tour in other countries (do you offer tours in other countries in South America?) as you have set both mine and Carter’s expectations quite high. 1. Roberto who was there at the beginning and end in Lima. 2. Glady’s who was like a walking National Geographic magazine. She knew EVERY piece in the Museum Lorca. And she knows history, politics, economics and more about Peru and Lima. 3. Museum Lorca, one of the world’ BEST. 4. the Peruvian buffet lunch with Gladys on the first day!! Wow! 5. Rio Sagrado Jr. Suite, one of the better hotels (service, grounds, bungalow, meals, location) that I have experienced. 6. the anthropological wonder of being part of a highlands family for a day–WOW! it was like being part of a National Geographic story being written. 7. Marcial as our guide, he is efficient, smart, insightful, always willing to aid and assist, a good listener and flexible. 8. Machu Picchu, one of the world’s treasures. 9. The beauty of the highlands landscape and mountain ranges, valleys, rivers which I never knew would be so majestic and appealing. 10. Inkaterra Machu Picchu a Garden of Eden on earth. 11. 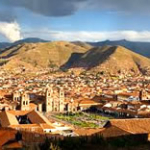 Cusco, great shopping, great restaurants and some interesting sightseeing too. 12. Michel, the organizer responsible for all who was always a pleasure to work with. Michel – thank you so much for your efforts and those of your staff and guides. We had an amazing time visiting your country and learning and experiencing many new and wonderful things. We particularly appreciated the opportunity to meet with the family in the highlands and spend time at your father’s home outside of Cusco. These are very nice inclusions to your tour agendas. 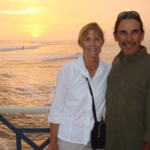 We have to compliment your 2 guides – Gladys and Marshall – for their expert assistance and knowledge. In our visit to the Largos museum in Lima – Marco and I thought that Gladys was a college professor – as she was so knowledgeable about the collection and the historical aspects of the Peruvian culture. Marshall did a great of balancing information and detail with the time available so as to provide a broad perspective without getting bogged down with too much information/detail on any one subject. 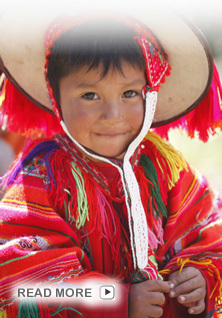 We would be happy to recommend your company and services to others traveling to Peru. Many thanks again for making our trip very enjoyable, diverse and informative. We arrived at home last night – safely and full of wonderful memories. We are remembering all the special things your company did to make our trip such an amazing adventure. Thank you, thank you for a perfect trip and such special memories! And please thank all the people who took care of us during the trip. They were all wonderful to us. 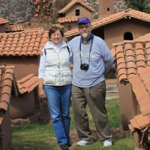 Joe and I want to specifically thank you for arranging our visit to Cusco and the Sacred Valley. Not sure who in the company did what, but the graciousness of you, your family, and your Peruvian Odyssey Tour Company was greatly appreciated by us and Melissa and Dennis. Everything went so smoothly. I know Melissa was worried about how she was going to get all the arrangements made so your assistance was very much appreciated. Seeing Chris holding the sign with our names on it when we arrived at the Cusco airport was great. We really felt pampered – like VIP’s. Having Elvira and Juan, as tour guide and driver, was also wonderful. Elvira was so knowledgeable about all the sights and very accommodating. We thoroughly enjoyed our 16-day vacation trip that Peruvian Odyssey and both of you so ably helped us plan for this past summer. Your company and its representatives, guides, and drivers expended extensive efforts to help us tailor the itinerary to our particular interests in archaeological sites, including visits to Ollantaytambo, Machu Picchu, Lake Titicaca, the Islands of the Sun and Moon, Tiwanaku, and many other sites in central and southern Peru and adjacent Bolivia. And the guides that you chose for us for the various parts of our itinerary were very knowledgeable and very helpful at all points during the trip. They were always attentive to our interests, including helping us with last minute changes in sightseeing locations as we traveled, which helped us maximize our enjoyment of the tour. A major highlight of our July trip was your company’s added extension, “A Magical Journey,” including the magnificent mountain scenery and wonderful archaeological sites we visited beginning in Cusco, traveling across Andean mountains and paramo of southern Peru, including Pampa Galeras Reserve and its wild herds of vicuñas and guanacos, as well as visiting sites in the Cuzco region, Nazca, Ica, and Paracas. Our vacation trip helped give us great respect for the pre-Columbian peoples of Peru and Bolivia for the immense efforts that went into the creation of their monuments, cities, and extensive agricultural terraces over thousands of years all over the Andes and Pacific coast. It is obvious that the work ethic and ingenuity of ancient South American peoples continues in the traditions of modern peoples in all the areas we traveled. We hope to arrange travel with your company again in the very near future. We also highly recommend your services to travelers who want a first-class vacation experience in Peru. 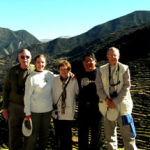 This was not our first travel experience with Peruvian Odyssey, having traveled under arrangements and itinerary created and led by your company in other parts of Peru in 2008, which was why we chose your company again to arrange and lead our vacation itinerary this year. Unique Destinations that only we can offer you! The Best Staff at your Service. The Best Hotels & Restaurants. 24 / 7 Concierge Assistant. You dream it we plan it! 100% custom made tours. We are a Social Responsible company.